For the first time in the history of Hungarian stamp issuance, three dimensional images made using the anaglyph, or colour filtering, technique are being released as part of the Treasures of Hungarian Museums series. These unusual miniature sheets require special glasses with red and cyan filters. The anaglyph image contains information for both eyes but different colour filters on each eye block some from reaching the left eye and some from the right eye, which creates a stereoscopic or three dimensional effect. 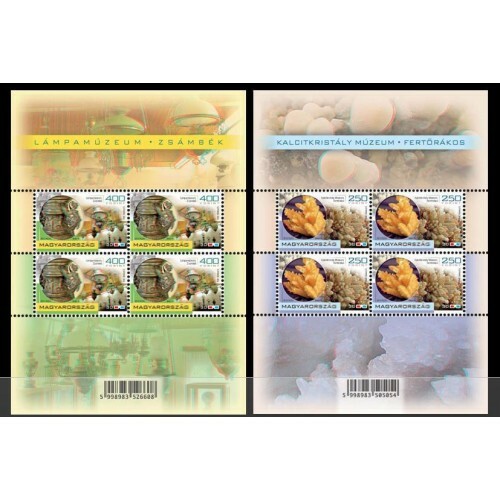 The miniature sheets Lamp Museum, Zsámbék and Calcite Crystal Museum, Fertőrákos are also available as an exclusive stamp set. The set in an A5 film-wrapped pack consists of one copy of each of the two different special miniature sheets with information in Hungarian and English, and a gift pair of 3D glasses. 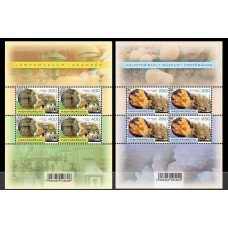 The new stamps are to be released on 3 May at Filaposta and large post offices in Hungary, but will also be available for purchase on Magyar Posta’s web site. The Calcite Crystal Museum is in Fertőrákos, a village located near Lake Fertő, which is on the World Heritage list. The protected private collection presents the mountains of Hungary and their sedimentary, igneous and metamorphic forms of rock through two thousand calcite crystals of different colours and shapes, and four hundred fossils. This collection, the only one of its kind in the world, is part of Hungarian National Cultural Heritage. The Lamp Museum, which houses over a thousand lighting devices, opened in Zsámbék in 1979. Its collection includes simple oil lamps, candle holders, industrial and domestic lamps, oil and paraffin lamps, lamps made from antique Chinese vases, and paraffin lamps with bases made of Zsolnay majolica and Meissen porcelain. The Museum was entered in the Guinness Book of Records in 1995, and became a member of the Rushlight Club (International Association of Collectors and Students of Historic Lighting) in 1980 and a member of the National Museum of Australia in 1983.